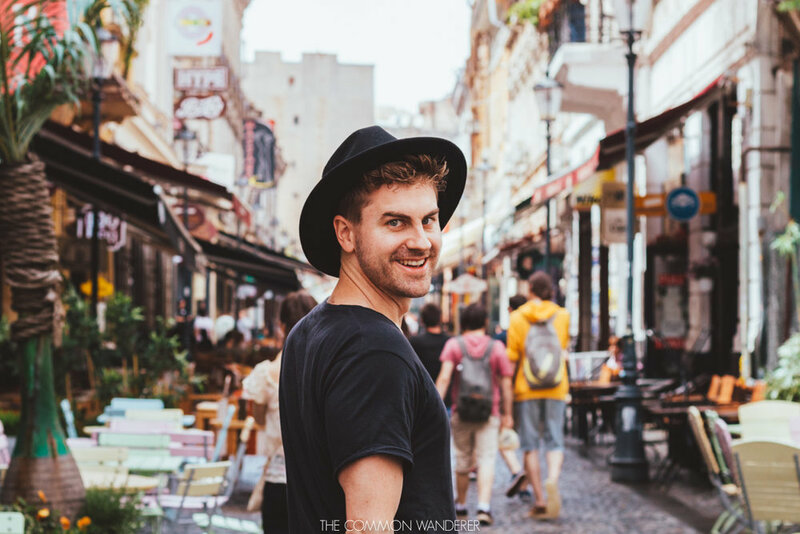 Mark shares how his solo travel experiences changed his life, and why you should travel solo at least once. I'm four hours into the Sunday shift stacking shelves in the dairy section of my local supermarket. As I place the remaining Greek yoghurt onto the shelf, I'm struck by the mundane monotony of it all - what has my life become? My mind wanders, and I picture myself arriving into a European city, full of hope and excitement. My revery is broken by the sound of my boss barking at me - "hurry up, Borts". I hop to it, but the thoughts persist for months. Life was pretty easy 12 years ago. I lived at home, I'd dropped out of university and I was spending earnings each weekend partying. Sure, I was having a good time, but this wasn't the life I'd envisioned for myself just a year earlier, when I'd graduated school and been accepted into Melbourne University. I'd lost sight of my passions in life. One day, I sat down and thought long and hard about what I valued in life, and what exactly those passions were. I even sought advice from my father, who suggested I get a job that allowed me to do what I love. What did I love and what were my passions? That answer was pretty simple; pretty much anything to do with travel. I knew my future lay in the travel industry, so I applied for a job at Qantas, with the idea that I'd use my job to explore the world. It worked. I got the job, and used the enviable staff benefits to travel to buy a ticket to Europe. I knew I needed to travel by myself; as cliche as it sounds, I needed to find myself, and I knew the only way to do that was to get right outside my comfort zone. Bang. Culture shock hit me hard as I stepped out of Gare du Nord in Paris on my first solo overseas trip. I didn't pre-book a hostel, I knew zero French, and I had no idea how to get around, and yet I expected everything to fall into my lap, much like it would in Melbourne. It didn't. A taxi driver refused to pick me up because I spoke English, and another local shooed me away when I asked for directions. Flailing in the heat, I stumbled around Montmartre for hours until I found a hostel with a bed available. Culture shock, and a feeling of complete helplessness prevented me from exploring a lot in Paris, apart from seeing only the most famous of sights. Giving up on Paris, I jumped aboard a train for Nice hoping for a change. And to my horror, Nice was worse. When I arrived, All the hostels in town were booked, so I found the cheapest room in town. I spent a day inside my horribly overpriced hotel room, too shy to head out and explore. I sat in bed, reading the latest Dan Brown novel, telling myself I was having a good time, yet I wasn't. I was depressed, and lost. One evening, after I dragged myself out of my dingy hotel room, I sat on the Nice foreshore, staring out across the sea, feeling incredibly alone and contemplating my next move. Two young Americans sat next to me, and after hearing English for the first time in days, I jumped in on their conversation without hesitation. They were studying abroad and were on a quick vacation in Nice. After a few hours, a decent meal, and a cheap beer or two, we went our separate ways, but not before they invited me to meet up with them and their friends the next day. I walked home with a spring in my step, feeling thoroughly invigorated. The next day was amazing; one of those perfect travel days. I met the two Americans and their group of hostel friends, and spent the day on the beach and exploring Nice. There was amazing conversation, amazing food, too much booze, and one hell of a fun day. All it had taken was one moment of fearlessness, to initially strike up a conversation with two strangers, to change my life. The shyness that seemed to follow me for my youth evaporated and the outcome gave me a welcome confidence boost. I realised I could no longer wait for things to come to me, I needed to pursue them. I realised I needed to work hard to achieve the amazing things I wanted in life. I realised I needed to go back to university and complete my studies. I realised people are inherently good, and to be more trustworthy. And I realised the privileged life I live is pretty damn awesome. The snowball effect from my moment of confidence meant the rest of my trip through Europe was one big lesson in how awesome life is. I decided to say yes to everything. I decided to I speak to everyone I met. And I decided to choose spontaneity over normality. I made lifelong friends, I re-enrolled in university, and I returned to Melbourne a new man. And that's the beauty of travelling solo. #1 YOU HAVE TO MAKE AN EFFORT EVERY. SINGLE. DAY. Seriously, to make the most of your solo travel experiences, you need to make an effort every single day. Whether it's speaking to the person sitting opposite you at breakfast, or the lady you buy a baguette off at lunch, you can't get by without making an effort. And it does wonders for your self confidence. You know that comfortable bubble you live at home? It doesn't exist on the road. Travelling solo will make you embrace the unfamiliar faces, places and challenges that present themselves at various points life. Like my experiences in Nice can attest, it's far better to open your life up to chance, than to not. Sometimes, just rolling with it can lead to the most incredible outcomes. Whether it's getting outside your comfort zone, learning a new culture, doing something slightly risky, or simply being comfortable with your own company, travelling solo will let you discover you, and in many ways that's the most important thing you can learn. Travelling solo will make you realise the value of experiences, not things. Let's be honest, eating a delicious gelato while overlooking the Cinque Terre is 100 times better than that new jumper you want. Yep, you'll HAVE to make your own decisions if you're travelling solo. There's the added benefit that you won't be held accountable for a bad decision, but when you do eventually travel with your partner, you'll be able to make the right decision every time (hopefully.). Exploring all the corners of the earth will leave you continually speechless, and you'll learn a lot from different cultures and ways of life. You'll learn that the Romans were seriously incredible, that Sri Lankans are extremely welcoming people, that Africa is actually pretty safe, that plastic is a scourge on this planet, that animal tourism is a no-no, and that, if you're reading this blog post, you're a fortunate human being. WANT MORE TRAVEL INSPO? TRY THESE POSTS!